Journal of Prisoners on Prisons launches a "Dialogue on Canada’s Federal Penitentiary System and the Need for Change"
Jarrod Shook (undergraduate student - uOttawa Criminology), Bridget McInnis (graduate in Criminology/Social Work at uOttawa and law student at University of Toronto), along with Justin Piché (Associate Professor - uOttawa Criminology) and Kevin Walby (University of Winnipeg Criminal Justice), co-edited Volume 26, Number 1&2 of the Journal of Prisoners on Prisons. 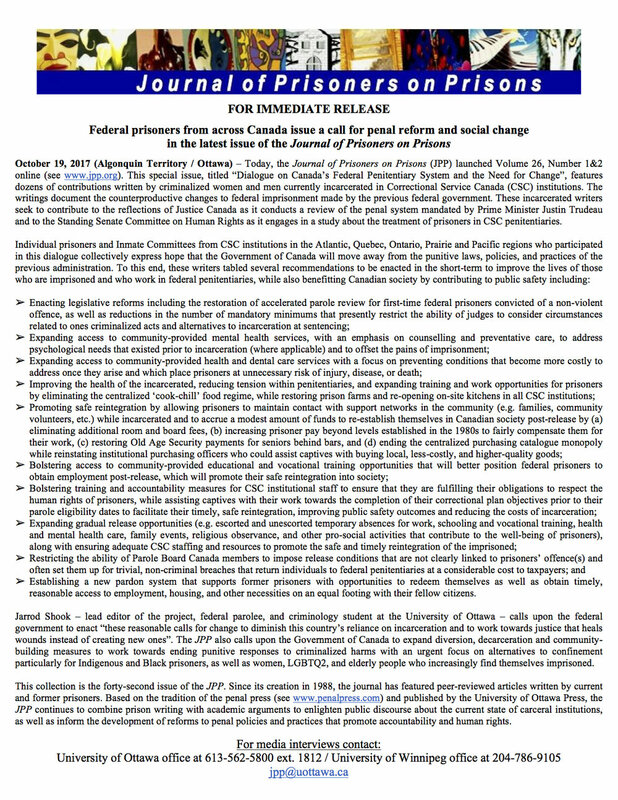 Launched today, the special issue - a "Dialogue on Canada’s Federal Penitentiary System and the Need for Change" - features 50 articles written by current federal prisoners on the impact of the previous government's laws, policies, and practices on CSC institutions. Journal contributors also include recommendations for social change as the Government of Canada conducts a review of the penal system. The special issue will be available in print in early November. In the interim, you can view the table of contents and download the articles online. Read the press release below for more details about the project.